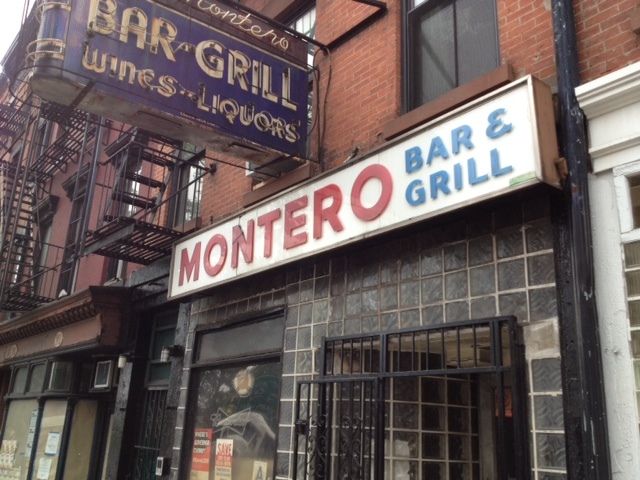 For whatever reason, Montero's, the old waterfront bar on Atlantic Avenue in Brooklyn, was without its red awning this past weekend. This happy absence afforded passersby the opportunity to take in the entire Montero's frontage in all its glass-brick glory. Here's hoping they leave the awning off. 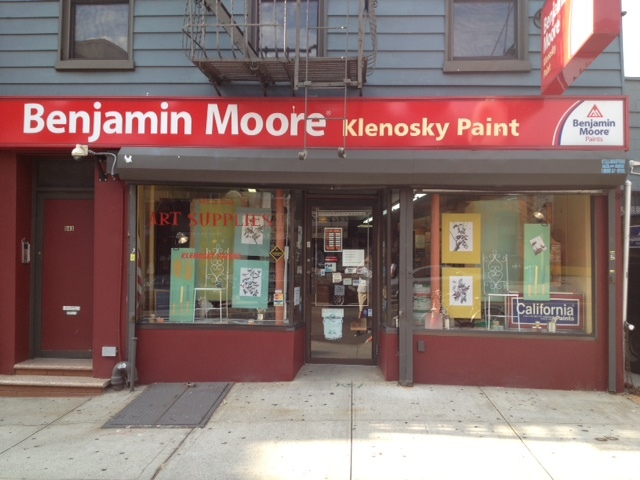 Klenosky Paint on Metropolitan Avenue in Williamsburg, Brooklyn, was the first shop I showcased in the running column "A Perfect Storefront," a feature I occasionally use to spotlight what I called at the time "Gothamite street art, coming in the form of conscious, sub-conscious or unconscious mercantile design." "What makes a perfect storefront?" I continued in that first column, which ran January 2010. "Well, a lot of things. Originality, for one. That doesn't mean the store owner has to be self-consciously bizarre or artful, just that they show a little character and individuality. One should be able to tell that the store is owned by a person or a family, not a corporation or chain... Great storefronts are almost always accidents of time, putting themselves together in haphazard style with the flipping calendar." There's further philosophizing here, should you wish to read it. Apparently, Klenosky didn't see the beauty of their own storefront. I walked by the other day and found the "new and improved" facade you see above. To which I can only say, "Thanks, Benjamin Moore corporate overlords!" I guess the hanging sign wasn't enough for them. Moore had to have it all. The Moore engine won't be satisfied until their taken over the signage on every independently owned family paint and hardware shop in NYC. Below, you can see the humble charm that once was. The Astrotower's 50-year life came to a sudden, unexpected and violent end over the past week, following reports on July 2 that the one-time Coney Island attraction was swaying worryingly in the wind. Officials shut down the Wonder Wheel and Cyclone rollercoaster, and all surrounding rides, in fear that the disused landmark might topple. Obviously, Coney Island can't remain indefinitely inactive during its peak operating season. So, soon enough, workers got busy dismantling the 270-foot tower, foot by foot. At first, the plan seemed to be to lop off just enough so the monument wouldn't present a danger. But I guess once the workers got into a rhythm, they didn't see the point of stopping. I had planned to journey down to Coney on Thursday or Friday to witness the Tower's trimming, but couldn't find the time under Saturday morning. What I encountered there when I arrived you can seen in the photo above. 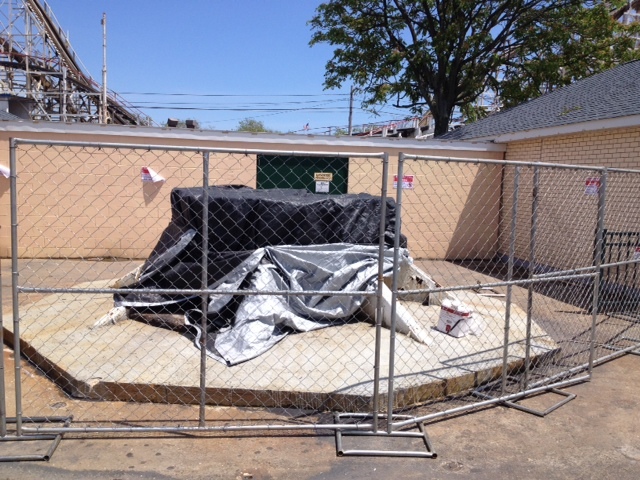 The Astrotower was completely gone, reduced to a stump fenced off by chain link. I had a tough time even finding the thing—something that was never a problem when the Tower was at its full height. The chunks of Tower were sold to a local junkyard for scrap. What a goddamned waste. Even as City Hall and real estate developers teamed up in recent years to strip Coney off all its character, the boardwalk retained four seemingly immutable landmarks: The Cyclone, the Wonder Wheel, the Parachute Jump, and the Astor Tower. Now there are only three. When Astroland, the amusement park that gave the tower its name, was unceremoniously kicked out a few years ago, the City was given the option of adopting the tower. The owners of Astroland were willing to make a gift of it to the City. But the City didn't want it, even for nothing. Astroland closed in 2008, and the Tower just stood there, untended. The far less interesting amusement park Luna Park grew up around it. 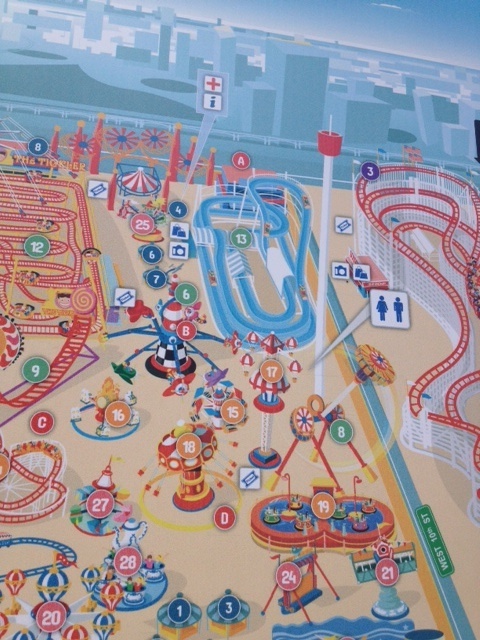 The only place you can see the Astrotower now is in this map of the Luna Park grounds. I have a feeling that, as long as keep this blog going (and maybe long after I'm gone), memories from people who experienced Cafiero's Restaurant will continue to flow in. Over the years, I've written about the long gone South Brooklyn Italian joint more than any other subject. 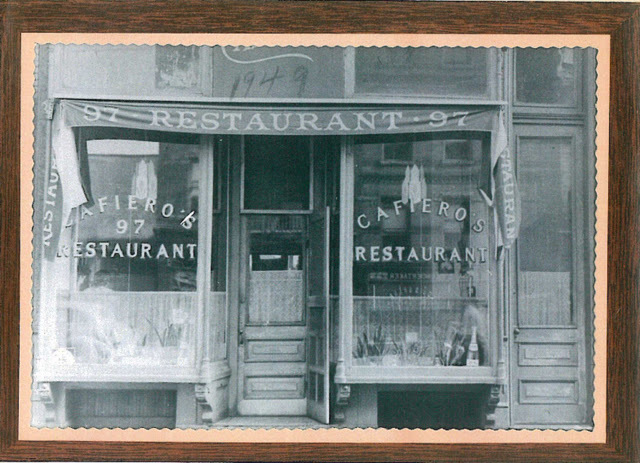 My posts have travelled far, and I've made connections not only to past patrons of the President Street eatery, but several actual descendants of owner Sharkey Cafiero and his relations. My best friend’s father was in the wholesale and retail poultry business and supplied Sharkey with his products. That couldn’t have been their only connection because of the way they were treated during their regular visits to Cafiero’s. My visits to Cafiero’s were during the late 50’s and early 60’s and always with my friend and his family, even when I had a son of my own (He was about two years old during his first and only visit to Sharkey’s). We always sat in the little Dining Room in the back. You had to pass through the kitchen to get there, so you got a good look at the four sauces on the cook-top and a huge dose of the delicious aromas. I do believe the menu was written on one white sheet of paper, however, other than the rolled stuffed steak, I never saw any of the items mentioned in your blog. I remember Veal & Peas, Veal and Mushrooms, Bragiole (not the rolled steak, but a large stuffed meat ball). Our favorite was pasta and meat sauce. We weren’t that interested in the pasta, it was the sauce we adored. What we really wanted was to finish the pasta and sop up the sauce with the best Italian bread I ever tasted (a Bowl & a Roll). No long thin sub shaped rolls, these were large bagel shaped breads about one foot in diameter and sectioned for easier tearing into fairly uniform chunks. Desert was around the corner at a waterfront bakery I can’t remember the name of. Inside were immaculate polished wood cabinets with framed glass “windows” that revealed marvelous old world pastry treasures. We were teenagers with gargantuan appetites and it was heaven!